Numerous research and development activities carried out by renowned research facilities and the global players in the polymer and solar industry – presented and discussed also within the framework of IEA SHC Task 39 – demonstrate that polymers are the materials of choice for next generation solar thermal systems. In addition to classical polymers made from petrochemical resources bioplastics (i.e. polymers based on renewable resources and/or biodegradable polymers) have been introduced as a sustainable and seminal alternative. Polymeric materials for solar thermal applications have to be tested thoroughly before they can be used for the construction of novel collectors. Used as absorbers, glazing or framing, just to mention a few applications, polymers are exposed to a broad variation of different environmental influences which may affect physical and mechanical properties of the materials and limit their service life time. Three major environmental influences, so called degradation factors are: temperature, UV radiation and humidity. One of these factors, the UV radiation, is of great impact on all organic macromolecules, like polymeric materials. Integrated storage collectors (ISC) offer a high potential for domestic hot water preparation in tropical, dry and moderate climate zones. In commercially available pressurized single-loop ISC systems the absorber/storage-tank is made from costly metals such as stainless steel or copper pipes. 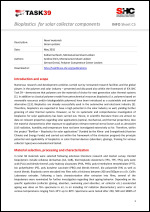 A specific objective of the European Union collaborative research project SCOOP (Solar Collectors made Of Polymers) is to develop and evaluate plastics based ISC tanks manufactured by well-established, high-throughput injection moulding technologies. This info sheet describes the collector concept, most-promising engineering plastics grades, experimental tools and manufacturing processes and the performance of functional model components. Hot water heat storages are important components of solar thermal systems. Various polyolefin-based material grades are material candidates to serve as liners in hot water heat storages. In order to fulfil the requirements, characterization of the aging behavior is indispensable for material selection. 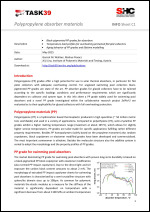 Polypropylene (PP) grades offer a high potential for use in solar thermal absorbers, in particular for flat plate collectors with adequate overheating control. For unglazed swimming pool collectors blackpigmented PP grades are state of the art. PP absorber grades for glazed collectors have to be tailored according to the specific loadings conditions and performance requirements which are significantly dependent on collector and system type. 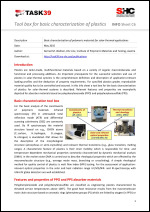 In this info sheet a PP grade widely used for swimming pool absorbers and a novel PP grade investigated within the collaborative research project SolPol-2 are evaluated as to their applicability for glazed collectors with full overheating protection. Without proper stabilization, polymers are susceptible to degradation caused by reactions with oxygen or UV-light, which lead to undesirable changes in the properties of the polymer. A stabilization system is normally added to the polymeric material, which is responsible for maintaining mechanical properties like strength and toughness. Unfortunately, it is not yet fully clear which combination of stabilizers provides the best performance for a specific application. Furthermore, interactions between different stabilizer classes have to be carefully investigated as they may lead to exploitable synergistic or avoidable antagonistic effects. Polymer based solar collectors are one of the important parts of modern architecture. Market demands are oriented to the colored absorbers to fulfil the demand of architects and integrate the collectors in new buildings. One of the options for production of colored collectors is usage of the Thickness Insensitive Spectrally Selective (TISS) paints. TISS paints are tailor-made, multifunctional materials based on a variety of organic macromolecules and functional and processing additives. The material aspects of the colored TISS paint coatings are focusing on pigments, metallic and metallized flake pigments and polymeric resin binders used for the production of solar paint coatings with the help of dispersant molecules in order to achieve uniform distribution of the finely ground pigment particles in the polymeric resin binder. An important prerequisite for the successful selection and use of pigments in solar-thermal systems is the usage of high absorptivity pigments with their high loading in combination with the low thermal emitting binder. Plastics are tailor-made, multifunctional materials based on a variety of organic macromolecules and functional and processing additives. An important prerequisite for the successful selection and use of plastics in solar-thermal systems is the comprehensive definition and description of application-relevant loading profiles and the deduction of property requirements. For specified plastics grades reproducible material quality has to be controlled and assured. In this info sheet a tool box for the basic characterization of plastics for solar-thermal systems is described. 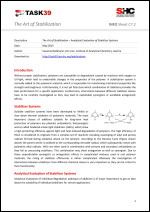 Relevant features and properties are exemplarily depicted for absorber materials based on polyphenyleneoxide (PPO) and polyphenylenesulfide (PPS). 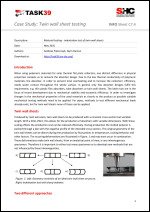 By: Weber, A., Resch, K.
--- Within this study, the effect of functional additives and processing conditions on the overheating protection performance of thermotropic systems with fixed domains (TSFD) for overheating protection purposes was evaluated. 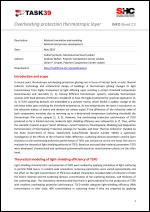 The focus was on improving the overheating protection performance of a prototype TSFD based on a UV curable acrylate resin by optimization of the material constitution (addition of functional additives like surfactants and nucleating agents) and the processing conditions (temperature conditions during manufacturing, annealing). 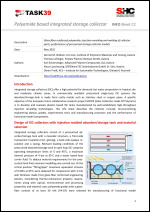 For the evaluated system, an effect of the nucleating agent on the overheating protection performance was ascertained. Furthermore, omission of an annealing step improved the overheating protection performance slightly. 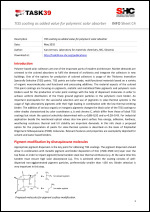 --- In this paper, the effect of material composition on the overheating protection performance of thermotropic systems with fixed domains (TSFD) is studied. Several thermotropic layers were formulated by variation of both, matrix material and thermotropic additive. Refractometry was applied in order to obtain refractive index data as a function of temperature of all material constituents and to screen wether material combinations are promising to formulate or not. Investigations concerning optical properties, switching temperature and switching process were carried out applying UV/Vis/NIR spectrometry. Morphological analysis was conducted with a Scanning Electron Microscope (SEM). Several TSFD showed reasonable light-shielding efficiency. Nevertheless further optimization of scattering domain size and shape is necessary to improve the light shielding performance. By: Koželj M, Orel B, Jerman I, Steinbücher M, Vodlan M, Peros D.
--- The invention relates to TSSS and TISS coatings applied by coil-coating onto substrates of copper or aluminum. Inorganic pigments functionalized by aminosilane are used for making paints, which after the coil-coating onto the substrate form the coatings. For the functionalization the pigment is dispersed in a solution of an aminosilane in a solvent or a mixture of a solvent and a binder without an addition of a non-aminosilane dispersing agent with or without subsequent grinding and use of 0.05-30 % of aminosilane on pigment. An aromatic, aliphatic, cycloaliphatic, ketone, ester, ether or alcohol compound or a mixture thereof can be used as the solvent. A silicone-polyester, polyurethane or fluoropolymer can be used as the binder. The effect of polyhedral oligomeric silsesquioxane dispersant and low surface energy additives on spectrally selective paint coatings with self-cleaning properties. Corrosion protection of Sunselect, a spectrally selective solar absorber coating by (3-mercaptopropyl) trimethoxysilane. Solar Energy Materials and Solar Cells (93) 10, pp. 1733-1742. By: KOŽELJ, Matjaž, ŠURCA VUK, Angela, JERMAN, Ivan, OREL, Boris. By: Resch, K., Wallner, G.M. and Hausner, R.
By: Kunic, R., Kozelj, M., Orel, B., Šurca Vuk, A., Vilcnik, A., Slemenik Perse, L., Merlini, D., Brunold, S.
--- Thickness insensitive spectrally selective (TISS) paint coatings based on a polyurethane polymeric binder deposited on copper substrates were investigated to obtain information about their service lifetime. The degradation of TISS paint coatings was performed according to the methodology worked out within Task 10 of the IEA's Solar heating and the cooling programme. The activation energy (Ea) for the degradation process was derived from vibrational band changes of the polyurethane binder recorded in the infrared hemispherical reflectance spectra of TISS paint coatings exposed to different thermal loads. The results of the vibrational band analysis were correlated with cross-cut tests, showing that the coatings started to lose integrity at 190 °C but protected the copper substrate against oxidation perfectly even at 200 °C (15 days). An accelerated test procedure confirmed that TISS coatings could be safely used in solar collectors for at least 45 years. By: Resch, K. and Wallner, G.M. 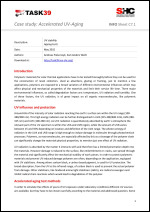 --- Within this paper a comprehensive review of the developments of thermotropic hydrogels, thermotropic polymer blends and thermotropic systems with fixed domains for overheating protection purposes is given. 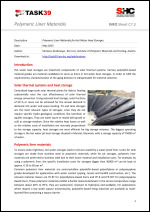 In addition, performance properties for thermotropic layers to prevent overheating in solar collectors are defined. The different thermotropic material classes are discussed as to their ability to meet these requirements. The review shows that thermotropic layers developed so far need to be adapted as to switching temperature and long-term stability for applicability in solar thermal collectors. --- Within this study the potential of thermotropic layers to prevent overheating of an all-polymeric solar collector is evaluated by theoretical modeling. The investigations show that collector stagnation temperatures can be reduced to temperatures between 80 and 90 °C by using thermotropic layers either in the glazing or on the absorber. For overheating protection to a maximum temperature of 80–90 °C a residual solar transmittance of the thermotropic layer below 0.25 in the opaque state (>0.85 in clear state) is effectual. The required switching temperature is dependent on the collector configuration.